(Newser) – After more than a decade of making cars and SUVs—and, more recently, solar panels—Tesla Inc. wants to electrify a new type of vehicle: big trucks. The company unveiled its new electric semitractor-trailer Thursday night near its design center in Hawthorne, Calif. CEO Elon Musk said the semi is capable of traveling 500 miles on an electric charge—even with a full 80,000-pound load—and will cost less than a diesel semi considering fuel savings, lower maintenance, and other factors. Musk said customers can put down a $5,000 deposit for the semi now and production will begin in 2019, the AP reports. "We're confident that this is a product that's better in every way from a feature standpoint," Musk told fans. Musk didn't reveal the semi's price. 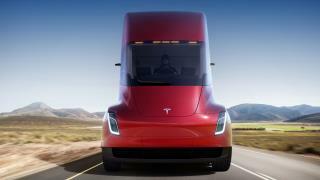 The truck will have Tesla's Autopilot system, which can maintain a set speed and slow down automatically in traffic. It also has a system that automatically keeps the vehicle in its lane. Musk said several Tesla semis will be able to travel in a convoy, autonomously following each other. Musk said Tesla plans a worldwide network of solar-powered "megachargers" that could get the trucks back up to 400 miles of range after charging for only 30 minutes. On Thursday night, Tesla—which is way behind on production of the new Model 3 lower-cost sedan—surprised fans with another product: an updated version of its first sports car, the Roadster. Tesla says the car, coming in 2020, will have a base price of $200,000, 620 miles of range, and a top speed of 250mph. Monster trucks/trailers need to be on a railroad track, not the public roadways. The new car is insane. 0-60 in 1.9s, a 1/4 mile in 8.9. and a 600 mile range to boot. When it gets down to $30K give me a call. Its amazing that they were able to create a battery that can haul 80,000 lbs for 500 miles and not take up the entire cargo space.